I have several layers which are stagged on each other. I need to create a label (or text-window / description, doesn't matter) which should contain values from different layers. Creating a regular label I can only choose attributes from this layer. Because the features have different nodes, it is not possible to just merge the layers. You can create a virtual layer that will compute the intersection between the layers and retrieve the desired values to be labeled. Then you would put a label on this virtual layer. Here is an example between two line layers, but this approach can be generalized to other types. This will create a new layer. Label it using the formula nameA || nameB or any other one that would concatenate the information to be shown. How to show labels for all polygons in a layer, even with 'NULL' values? 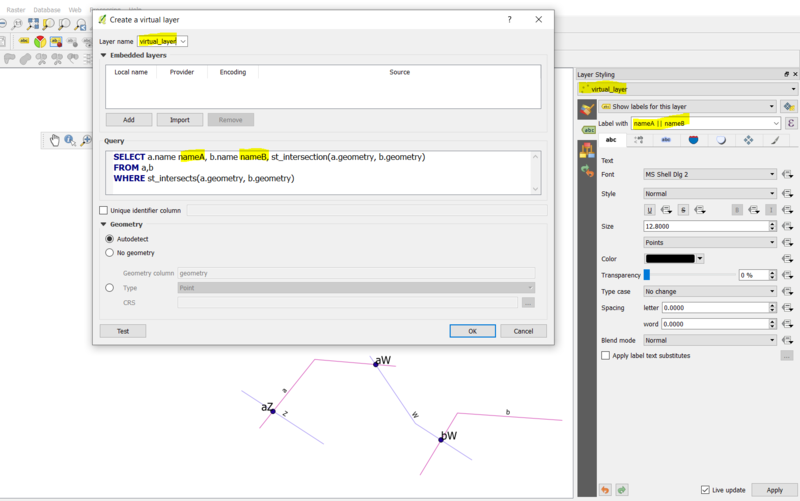 How to display multiple attributes in a QGIS Composer legend? Can labels for overlapping points be combined/merged into one label? Single label for multiple features with different values in ArcGIS Desktop? Summing pixel values from several raster layers with partial overlap in QGIS? labeling feature based on defined Value Map in QGIS?